The night before the camp, Manuel emailed to say he wouldn’t be working out due to a shoulder injury but planned to show up to the event to watch from the sidelines. Once he arrived at the field, however, that plan went out the window. The Miami commit went through every drill and fought through pain to earn an invitation to the Rivals100 Five-Star Challenge. A top 2020 prospect, Manuel was hindered by his injury but still created massive separation on nearly every route he ran. A Miami commit, Manuel played through an injured shoulder and showed well despite the pain. 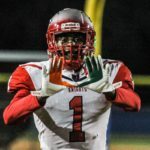 Manuel is clearly one of the top wide receivers in the class of 2020 and could serve as the cornerstone of Hurricanes’ class. 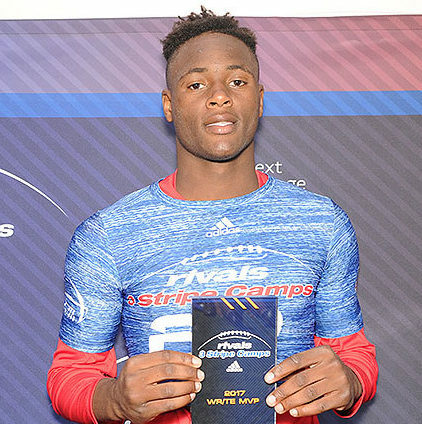 Manuel has the talent to go up against any 2019 defensive back and will get the chance to prove it at this year’s Five-Star Challenge. Manuel will have plenty of coaches perusing him up until Signing Day 2020, so Miami will have to work to hold on to his pledge. While waiting for more good news from its big weekend, Miami added a piece to its future. 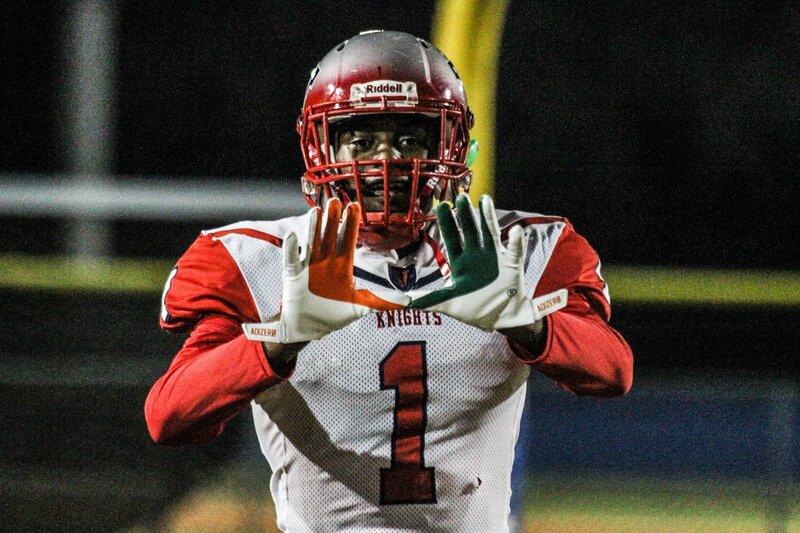 One of the top-rated underclassmen in the nation, wide receiver Leonard Manuel, said he will play for the Hurricanes. 247Sports rates Manuel, listed at 6-foot-4 and 200 pounds, as the sixth-best player in the 2020 class, the second-best wide receiver and the best overall prospect in the state. 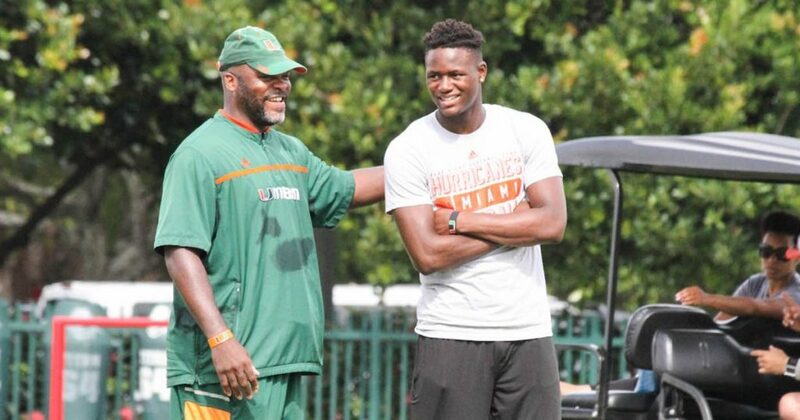 Manuel will be a sophomore at Ocala-Vanguard High, the same program that produced Hurricanes freshman quarterback N’Kosi Perry. UM also has a 2020 commitment from athlete Avantae Williams, whom 247 rates 13th overall in that class. Miami’s 2019 class is rated fifth nationally and the 2018 group is rated fourth. UM WR Target Leonard Manuel checks in at No. 6 overall. 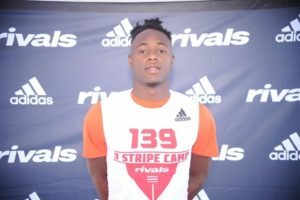 Other Miami targets in the initial 2020 rankings include: Ocala Vanguard wide receiver Leonard Manuel (No. 6 overall), Miami Belen Jesuit running back Don Chaney Jr. (No. 14 overall), Oakleaf offensive tackle Jalen Rivers (No. 59 overall), Orange Park Oakleaf defensive end Chantz Williams (No. 63 overall), IMG Academy defensive end Tre’Von Riggins (No. 65 overall), Watkinsville (Ga.) Oconee County quarterback Max Johnson (No. 68 overall), Miami Norland defensive end Samuel Anaele (No. 72 overall) and Ocala Vanguard guard Miller Lewis (No. 91 overall). Recruiting wrap: Just a rising sophomore, Manuel already has offers from Florida, Miami and several others. Performance: The 6-foot-5 wide receiver is still technically a freshman in high school, but you wouldn’t have known it with the way he performed. He was a match-up nightmare for defensive backs all day and while he had a few hiccups that come with his age, it’s clear he’s well on his way to being a special talent. Manuel earned the wide receiver MVP award for his efforts.